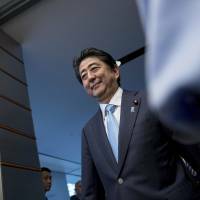 A shoo-in a few months ago, Prime Minister Shinzo Abe’s plunge in popularity imperils his re-election to a third term as LDP president in September 2018, fueling speculation about when he will go and who will replace him. That said, it’s still too soon to count him out. It’s astounding that 83 percent of the public in a recent Asahi poll don’t believe the prime minster’s denials of cronyism regarding the special exemption granted an old friend, Kotaro Kake, to open up the nation’s first veterinary school in half a century. Whether or not Abe is fibbing, few seem to believe him and his public support rate has cratered by 20 points from earlier this year. A recent Cabinet reshuffle saw him get only a modest bounce of 4 percent in public approval in the NHK poll to 39 percent. In that poll, 78 percent didn’t buy Abe’s denials of cronyism, while just 3 percent fully believed his explanation and just 12 percent were partially persuaded. His credibility is shot and the public has turned against him. In the United States, a recent poll indicates that 73 percent of Americans don’t trust the information coming out of the White House, so even a serial fabricator such as President Donald Trump comes out better than Abe. In the recent NHK poll, among Abe’s supporters, half say that it is because there is no alternative. This “no alternative” factor means that support for Abe is fragile, as it is not based on his policies or leadership, but rather reflects his good fortune of having a fractured opposition led by the zombie Democratic Party and no strong rivals within the Liberal Democratic Party. Cue Yuriko Koike, the woman who clobbered the LDP in the Tokyo Assembly elections in early July. This landslide victory fueled speculation that she would try to take her Tomin First no Kai (Tokyoites First) movement to the national stage and that is now happening. Masaru Wakasa, a close ally of Koike in the Diet, announced the formation of Nippon First no Kai (Japan First) that seeks to become a viable alternative to the LDP. Koike embraces right-wing political positions, visits Yasukuni Shrine every year and once belonged to Japan Conference (Nippon Kaigi), an elitist right-wing lobby organization that wields considerable political influence in the corridors of power. Koike also threatened to close an ethnic Korean school in Tokyo during her gubernatorial campaign. However, she shrugged off this baggage and has reinvented herself as an anti-establishment maverick. Koike understands the theater of politics, putting on a show and dazzling the people as she did with the Tsukiji fish market relocation drama and the 2020 Tokyo Olympics inquisition. She made the LDP dinosaurs squirm in the limelight, delighting a public weary of all the dubious deals that feather the nests of cronies at the taxpayers’ expense. However, Nippon First doesn’t look like a real alternative to the LDP because Abe and Koike share the same ideological bandwidth. Much depends on what kind of party realignment she can organize. These days, however, simply not being Abe seems to be an advantage. It’s still early days, but in a recent Jiji poll, 52 percent oppose the re-election of Abe as LDP party president and only 32 percent support him. As for current public preferences for prime minister, Shigeru Ishiba came out on top followed by Abe with Koike a distant fifth. Speculation is heating up that Abe may call a snap general election on Oct. 22 before Koike’s party can get organized to make the case that, flaws and all, he is better than any of the alternatives. This would be a big gamble, putting the ruling coalition’s two-thirds majority at risk. Moreover, a setback would force Abe’s departure. 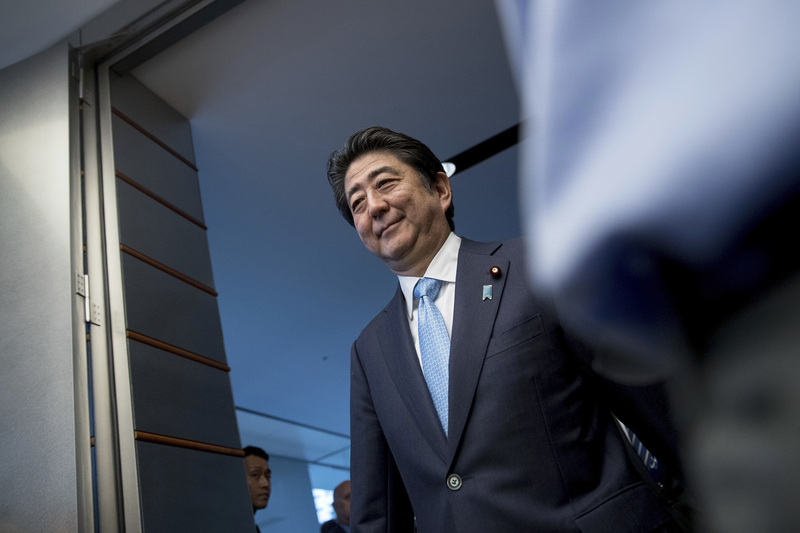 Abe is banking on economic growth and the recent Cabinet reshuffle to brazen out his scandals and trust deficit, but the new team is stumbling out of the blocks. For example, new Education Minister Yoshimasa Hayashi got off to a bad start by suggesting that he will work hard to restore the ministry’s damaged credibility, saying that it had lost the public’s trust because of how it handled an internal investigation into leaked documents regarding Kake Gakuen that put Abe in the hot seat. Really? In fact, the ministry came out looking responsible, serving the public interest and transparency as Abe’s administration tried to stonewall an investigation to find leaked documents that were splashed across the mass media, ones that Chief Cabinet Secretary Yoshihide Suga disingenuously dismissed as dubious. Ministry officials produced detailed notes of meetings that backed up allegations that the prime minister’s office applied pressure and greased the wheels for Kake Gakuen’s application. Thus it was Abe, not the ministry, that lost credibility over the scandal and it is his public support that imploded as a result. The ministry deserves kudos, not Hayashi’s scapegoating. He can best boost his ministry’s credibility by canceling the Kake Gakuen project. At a news conference on Aug. 8, Suga grew flustered when an Asahi reporter, making a pointed reference to recent cases of mishandled or missing documents, quoted his 2012 book, “Seijika no Kakugo,” on the duty of officials to preserve documents, and that not doing so constitutes a betrayal of the public trust. Ironically given the recent cases of mislaid and vanishing documents, Suga seems to have failed to recognize what he had written. He also seemed to be auditioning for a job at the White House when he dodged queries on Aug. 10 regarding an April 2015 meeting between Tadao Yanase, one of Abe’s secretaries at the time, and officials from Kake Gakuen and Imabari (the site of the planned veterinary school), telling them that a news conference was not the place to answer such questions and they should stick to asking about official statements and established facts. In Diet testimony, Yanase couldn’t remember the meeting and no records were kept from that period to confirm either way. In survival mode, a diminished Abe will try to win back the good graces of voters through various handouts and try to convince them that he really is not so impatient for constitutional revision. He understands that his pushiness on this backfired, amplifying the damage caused by his scandals and fallout from the sharp-elbowed passage of conspiracy legislation. Abe is hoping to distract the public with Abenomics razzmatazz while hanging in there because what he really covets is a legacy of constitutional revision.